Here are the answers to last week’s crossword. Read the clues below to learn more about mental health. 4. Suicide is a choice many mental health patients make. It’s often a choice because they’re left out of social activities and lack a social group because of stigma. 6. A phobia is defined as an intense and irrational fear. It occurs in many forms. Claustrophobia is one of the most common: an intense fear of tight closed in spaces. But phobias can be treated. 9. The CMHA or Canadian Mental Health Association is devoted to helping treat mental health, raise awareness and end stigma against mental health. 1. A disease is a health problem like the flu that is contagious. A disorder is a health problem that isn’t contagious. It doesn’t just include mental illness. Cancer and epilepsy fall into this category. 2. The greatest effect a mental illness has on a person is behaviour. Disorders such as obsessive-compulsive disorder (OCD) causes a person to feel as if they must (compulsion) perform repeated actions (obsess) to reduce anxiety. It can take the form of an action – washing hands, cracking knuckles, etc. or thoughts – continual prayer in situations, repeating a phrase, repeating a name, etc. 3. #BellLetsTalk. Since 2010 it’s raised over $73 million. Annually Bell Canada sets a date to raise funds to donate to mental health initiatives by encouraging Canadians and the world to talk. For every Tweet, social media share and call made by a Bell Canada or Bell Aliant customer 5 cents were devoted to mental health. 4. Stigma: a negative stereotype. Mental health is believed to be a disorder that changes a person and makes them unsociable. Patients with mental health disorders are not discriminated but stigmatized. They’re left out of social networks because others don’t want to associate with them and be associated with mental health. 7. Phobias are feelings of extreme fear. Many believe depression is a feeling of extreme sadness but it includes feelings of worthlessness and fear. It is treatable with the help of support groups and counselling. 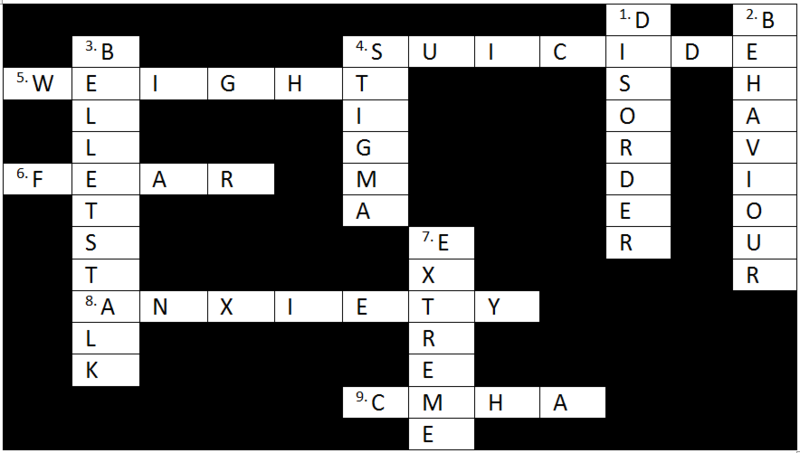 This entry was posted in Crosswords, Mental Health and tagged #BellLetsTalk, anxiety, Canada, depression, Disability, Education, Health, suicide by Rahman. Bookmark the permalink.